I accept commissions for one-off pieces and repairs to most leather items. I also welcome appointments to visit my London studio where every piece is designed and made. I trained as a saddler at Capel Manor college, and I am accredited as a qualified saddler by the Society of Master Saddlers. 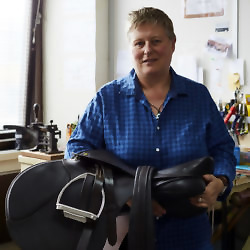 Steph Rubbo Saddlery specialises in making beautiful, durable, bespoke leather goods, using traditional saddlery tools and techniques. My range of products includes briefcases, satchels, handbags, belts, card holders, pet collars and leads, as well as bridles and saddles, all created with the highest quality craftsmanship. From cutting to finishing, each of my pieces is unique, handmade from English bridle leather, waxed linen thread, solid brass or nickel fittings, linings of soft nappa and embossed monograms on request. The result is a truly personal product that gains character over time.